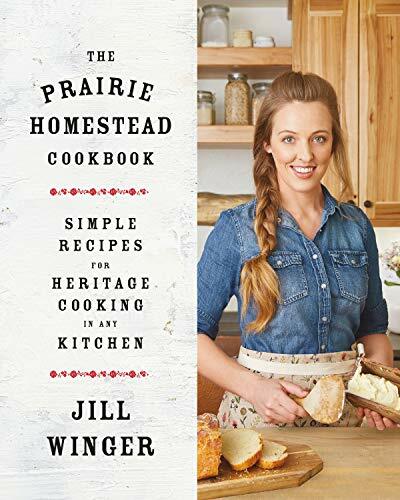 Jill Winger, creator of the award-winning blog The Prairie Homestead, introduces her debut The Prairie Homestead Cookbook, including 100+ delicious, wholesome recipes made with fresh ingredients to bring the flavors and spirit of homestead cooking to any kitchen table. The Pioneer Woman Cooks meets 100 Days of Real Food, on the Wyoming prairie. While Jill produces much of her own food on her Wyoming ranch, you don’t have to grow all―or even any―of your own food to cook and eat like a homesteader. Jill teaches people how to make delicious traditional American comfort food recipes with whole ingredients and shows that you don’t have to use obscure items to enjoy this lifestyle. And as a busy mother of three, Jill knows how to make recipes easy and delicious for all ages. "Jill takes you on an insightful and delicious journey of becoming a homesteader. This book is packed with so much easy to follow, practical, hands-on information about steps you can take towards integrating homesteading into your life. It is packed full of exciting and mouth-watering recipes and heartwarming stories of her unique adventure into homesteading. These recipes are ones I know I will be using regularly in my kitchen." - Eve Kilcher These 109 recipes include her family’s favorites, with maple-glazed pork chops, butternut Alfredo pasta, and browned butter skillet corn. Jill also shares 17 bonus recipes for homemade sauces, salt rubs, sour cream, and the like―staples that many people are surprised to learn you can make yourself. Beyond these recipes, The Prairie Homestead Cookbook shares the tools and tips Jill has learned from life on the homestead, like how to churn your own butter, feed a family on a budget, and experience all the fulfilling satisfaction of a DIY lifestyle.